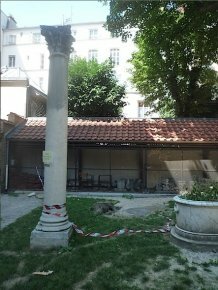 26/7/12 - Heritage - Paris, Ecole nationale superieure des beaux-arts - A burst water pipe can happen any time. When it happens on a Sunday night, at 2 am, mid-July , it is particularly unlucky and this is what took place in the basement of the Ecole nationale superieure des beaux-arts, causing part of the back of the Lenoir gardens to collapse, on the north side of the Palais des Etudes. However, the fact that the firemen who arrived at 3 am, alerted by the superintendents after they could no longer manage the situation, were unable to get in touch with any of the school officials for two hours because no one was on call, thus losing a valuable amount of time in understanding the site, is extremely serious. 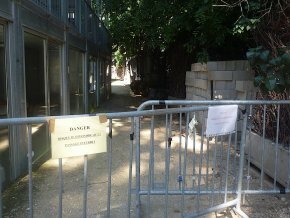 Nicolas Bourriaud, the director of the school, told us that the person in charge of security was on sick leave, thus explaining the problems in contacting someone...In the meantime, the site is now closed off with signs stating there is "Danger of cave-in" (ill. 1). We must admit that the new director has taken over his position in an unfavorable climate, with the state of the school in deplorable conditions : "We must now undertake the complete repair of the electrical system because if not we would be forced to close. This will cost us over 2 million euros, to be drawn from the institution’s working capital. This situation has been handed down to us, as was the disastrous condition of the water pipes which caused the accident on 16 July and other flooding, elsewhere." The situation resulting from this flooding is all the more disquieting because, although some of the water was pumped out, no one knows where the rest has disappeared to ! Perhaps into a cavity in the ground which, eroded, has partly collapsed (ill. 2), creating an unpredictable threat, not only for the foul "temporary" building housing the Nanterre architectural school (ill. 3), now a permanent installation which is perfectly illegal, but also, and most importantly, the stability of the vestiges of the hotel de Torpanne, already extensively damaged, (ill. 4), and the Palais des Etudes. We contacted the chief architect for historical monuments responsible for the building, Benjamin Mouton who does not think that the Palais des Etudes, whose foundation he states is solid, is really in any danger. He is however more concerned with the ruins of the Hotel de Torpanne. 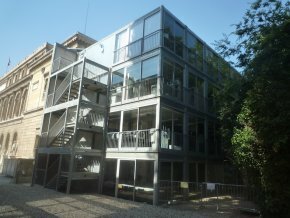 We had already written an article, in French, about it as well as the building of the architectural school. Not only has the situation not improved, it has even worsened. How long will the French Ministry of Culture tolerate this in the heart of Paris, in a monument which it is supposed to be managing ? 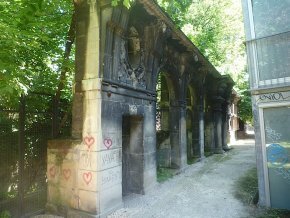 The building of the architectural school is an illegal structure, a mar on a listed monument which should be removed ; the 16th century sculpted archways in the Hotel de Torpanne represent a major heritage element which should be saved and restored. Perhaps the flooding which just occurred in the basement of the Ecole nationale superieure des beaux-arts will serve as a warning signal to resolve these two scandalous shortcomings. On the night of Sunday 15 to Monday 16 July, to be precise.